Last week I let you in on the latter half of my top 20 picks for the decade's best singles from the punk scene. There was some good feedback, so I know you're all just dying to get to number one. So without further adieu, here are the top 10 from Backstage Press. 9. Brand New - "Jude Law And A Semester Abroad" Off their 2001 release, Your Favorite Weapon, Brand New showed us what a little Long Island angst can do. I can only guess how many times these lyrics popped up in away messages on college campuses. Damn English boys. 8. 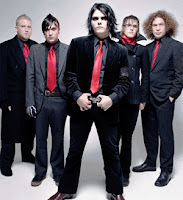 My Chemical Romance - "Helena" Two parts rock, one part Halloween. Served to a blood thirsty mob of emo enthusiasts back in 2004. Helena's epically choreographed video was proof that death can be artsy, but only if all the guys in the room are wearing make-up of course. 7. Motion City Soundtrack - "Everything Is Alright" It's hard to find a band with an original sound anymore. But it's safe to say MCS' hit off 2005's Commit This To Memory was a brand new blend of pop-punk. I mean, you've got to expect greatness when you've got a moog player, and Mark Hoppus producing you. 6. Hawthorne Heights - "Ohio Is For Lovers" This wasn't necessarily one you heard on the radio, but to anyone with hair covering at least one eye, this 2004 single was a gateway drug to the scene. I don't care what anyone says, Hawthorne Heights still owns. Punks. 5. Jimmy Eat World - "The Sweetness" Are you listening? You should be, 'cause this 2001 jam has got everything a timeless rock song needs. It's catchy, simple and the perfect singalong - even if you don't know the words. Woah, oh oh oh oh oh! 4. Taking Back Sunday - "Cute Without The 'E' (Cut From The Team)" Although I still don't know what a "clever napkin" is, I've got to give it up to TBS for their 2002 hit off Tell All Your Friends. Any song that can make me mosh by myself in my apartment ranks highly with me. 'Nuff said. 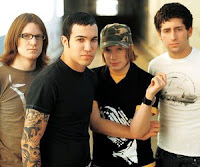 indefinite hiatus, FOB's "Sugar" gave every hungry, and somewhat lost, pop-punk fan what they needed. The Chicago natives filled the void with this radio-friendly hit. It's what ultimately launched them into punk-rock stardom. Well, that, and those racy photos of Mr. Wentz that hit the internet. Come on, we've all seen 'em (whether we wanted to or not). 2. New Found Glory - "Hit Or Miss" An old-school classic from the Florida-based punks. It's hard not to hear remnants of this 'hit' today with bands like A Day To Remember or Broadway Calls. Just try a YouTube search of this song and you'll see just how many different bands, and crappy new guitarists alike, have covered this beauty. A pop-punk masterpiece. 1. blink-182 - "What's My Age Again?" I may be a bit biased, as blink is my favorite band of all time, but you can't deny the impact that this song has had on culture as a whole. WMAA? is 10 years old this year, and is as timeless as ever. If you saw blink this past summer then you know that when this song was played, the trio were practically drowned out by the masses. When MTV launched this single back in '99 to every tween watching TRL, it was an instant classic. And it's only gotten better with time. I mean, I'm finally 23 and I can see what they were saying. Oh well, at least the song has some new meaning now.